Celebrate your love and devotion with this adorable engravable ring. Engrave up to 10 characters per engraving area. 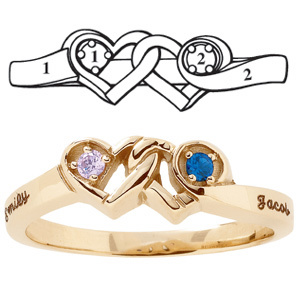 The Loving Promise ring features personalization for two 2.0mm round birthstones. Choose 10kt or 14kt, yellow or white gold. This mother's ring is available with simulated or genuine birthstones. This ring is always set with two birthstones. Import.